Italian physician; born at Guastalla 1796; died at Venice Dec. 27, 1859. He graduated as doctor of medicine from the University of Padua in 1817 and settled in Venice, where he practised until his death. 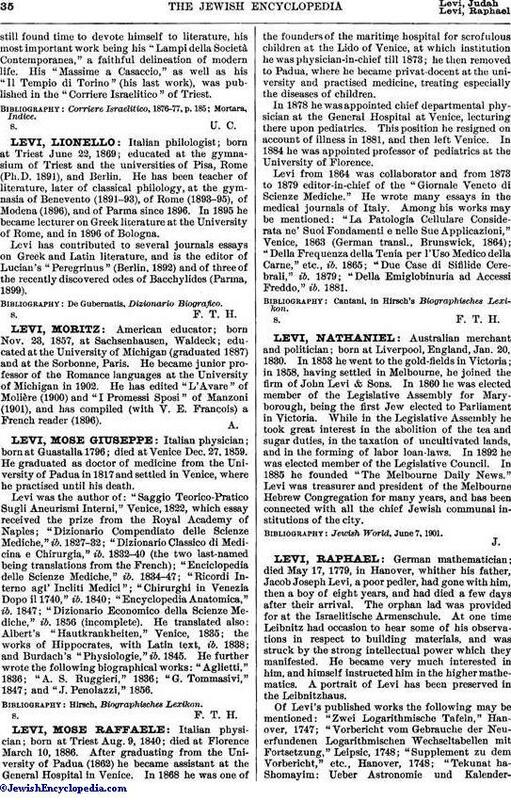 Levi was the author of: "Saggio Teorico-Pratico Sugli Aneurismi Interni," Venice, 1822, which essay received the prize from the Royal Academy of Naples; "Dizionario Compendiato delle Scienze Mediche," ib. 1827-32; "Dizionario Classico di Medicina e Chirurgia," ib. 1832-40 (the two last-named being translations from the French); "Enciclopedia delle Scienze Mediche," ib. 1834-47; "Ricordi Interno agl' Incliti Medici"; "Chirurghi in Venezia Dopo il 1740," ib. 1840; "Encyclopedia Anatomica," ib. 1847; "Dizionario Economico della Scienze Mediche," ib. 1856 (incomplete). He translated also: Albert's "Hautkrankheiten," Venice, 1835; the works of Hippocrates, with Latin text, ib. 1838; and Burdach's "Physiologie," ib. 1845. He further wrote the following biographical works: "Aglietti," 1836; "A. S. Ruggieri, 1836; "G. Tommasivi," 1847; and "J. Penolazzi," 1856.